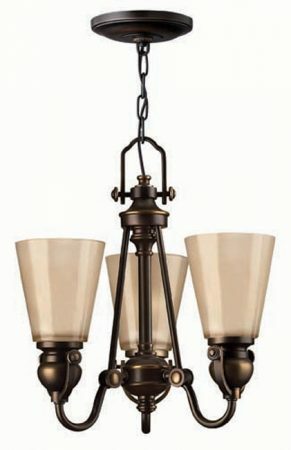 The Hinkley Mayflower olde bronze 3 light chandelier with amber glass shades is supplied by Elstead Lighting and designed by Hinkley. A bold traditional design finished in dark bronze, with inside etched amber glass. The unique yoke-mount glass holders and decorative cast tension knob detailing add authentic flair. Suspended from a circular ceiling rose, the design of this ceiling light incorporates not only the fitting but the central suspension with immense detail. A horse-shoe shaped finial supports the chain links and is connected to the T-bar. The compact three light chandelier takes on a pyramid silhouette with slanting rods encasing the central stem. Three soft amber tint glass shades with an etched inner create a warm inviting atmosphere. A stunningly exquisite designer creation perfectly suited to any room in the house. Supplied with 152cm of chain that can be shortened at the time of installation to suit your situation, please see the technical information below for dimensions. Designed in the USA by Hinkley Lighting, founded in 1922 in Cleveland, Ohio. 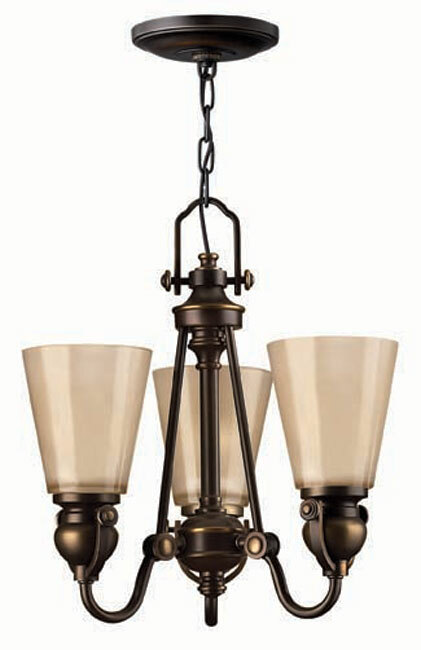 Their long heritage combines with a pursuit of innovative design to create modern and contemporary lighting like the Mayflower olde bronze 3 light chandelier with amber glass shades featured here.